Tree branches are encased in frozen rain as the sun sets Sunday in this display of fire and ice. Winter Storm Harper brought a significant layer of ice here on Saturday before blowing through the rest of the way with about 6 inches total of ice and snow. High winds and blustery snow squalls made rural road travel dangerous late Saturday night into Sunday. Some power outages were reported in the area due to ice and wind, but no widespread incidents are known to have affected Champaign County. The Champaign County Sheriff’s Office issued a Level 1 Snow Emergency on Saturday before upgrading it to a more serious Level 2 declaration. The county was back to Level 1 on Sunday and remained there through most of the day Monday. Temperatures plummeted from 31 degrees with rain on Saturday afternoon to minus-10 degrees with a minus-15 degree windchill by Monday before sunrise. The crystal clear skies Sunday night allowed for full viewing of the lunar eclipse between 10:30 p.m. and 11:45 p.m.
Plants and trees stayed coated in ice all day on Sunday as temperatures hovered around 10 degrees with brilliant sunshine. 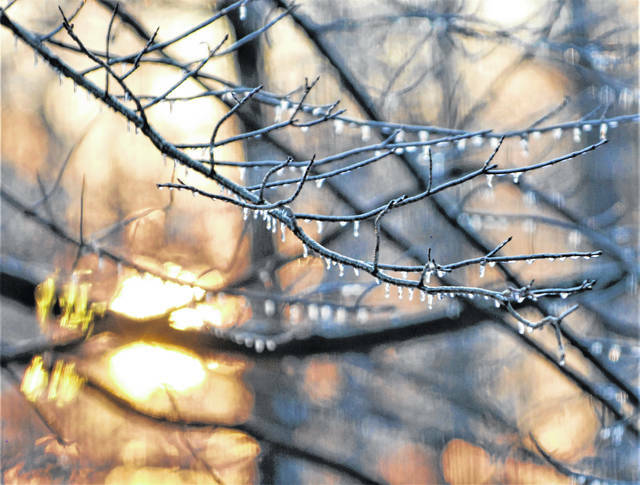 Trees were still coated in ice on Monday at noon as temperatures climbed to only 2 degrees under sunny skies. Another blast of cold air is forecast for next week, although not as frigid and dramatic as what occurred over the past weekend.